Zimbabwe's key referendum on a new constitution has been "tentatively" set for 16 March, government minister Eric Matinenga has said. Prime Minister Morgan Tsvangirai said the referendum would herald a major step towards democratic reform, AFP news agency reports. It would be followed by elections, expected to be contested by Mr Tsvangirai and President Robert Mugabe. The date was announced as the election chief resigned, citing ill health. The 88-year-old Mr Mugabe has been in power since independence in 1980. Details of the new constitution, agreed by Mr Mugabe and Mr Tsvangirai, have not been officially released. But it is believed that it sets a limit of two terms for future presidents. Mr Mugabe and Mr Tsvangirai are expected to urge voters to approve the constitution, opening the way for elections to be held under the new rules. The election would herald the end of the shaky coalition the two leaders formed after the disputed 2008 election, when Mr Tsvangirai - the leader of the Movement for Democratic Change (MDC) - boycotted a run-off after claiming he had been robbed of victory during the first round. Mr Mugabe's Zanu-PF party was also accused of unleashing violence against MDC supporters, an allegation it denied. The two parties then formed a coalition government under pressure from regional leaders. "I can confirm 16 March is the tentative referendum date," said Mr Matinenga, the constitutional affairs minister, an MDC member. "I've indicated that maybe there's a need to rethink so that at least we have two days of voting for the referendum," he added, in a briefing to journalists in the capital, Harare. Sources say the general elections are expected to be held between 15 and 30 July. Mr Tsvangirai told AFP he would fight to ensure that "no-one is disenfranchised by hook or by crook" in the elections. "If Mugabe's position that we need a free and fair election is a ruse, then he would have cheated me," he is quoted as saying. Meanwhile, election commission chief Simpson Mutambanengwe, who was expected to organise the votes this year, has resigned, said Justice Minister Patrick Chinamasa of Zanu-PF. MDC Secretary-General and Finance Minister Tendai Biti said his decision was regrettable. "The judge is a man of good standing," he said. A replacement for Mr Mutambanengwe, a retired judge who was appointed after the disputed 2008 poll, would be chosen after discussions involving the coalition partners, Mr Chinamasa said. 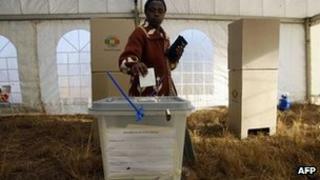 Zimbabwe's crash-strapped government has also repeatedly said it does not have enough money to hold the votes. "We are looking for the money," Mr Tsvangirai told AFP.